We are excited to share a detailed overview of BidiPass’s proprietary technology through our official Technical Paper. 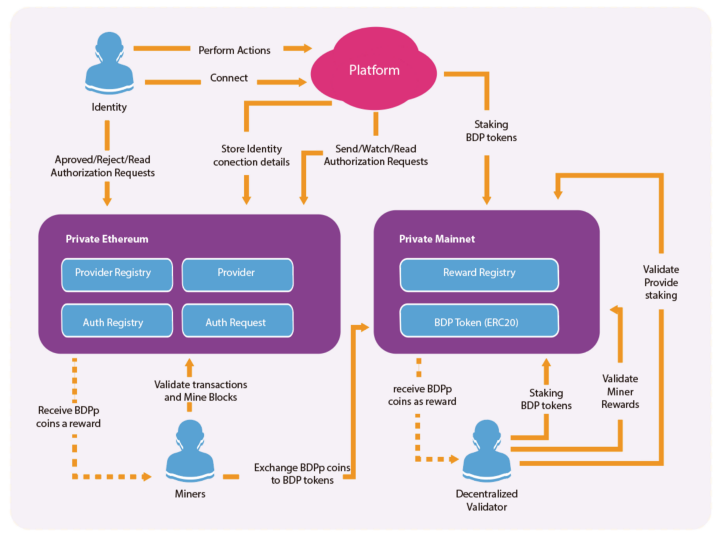 This paper delves into how BidiPass is using blockchain technology to create a peer-to-peer two-layer security protocol that combines HOTP algorithm and biometric authentication. Through this approach, we are able to create a dependable and scalable authentication tool that can bring elite cybersecurity technology to mass market consumers. Here, we’d like to share some of the highlights of our tech paper and give a general understanding of the BidiPass platform and blockchain network. *The BidiPass Technical Paper includes a glossary for your convenience starting on page 3 that explains any unfamiliar terms. *Each heading below is followed by a number in parenthesis that corresponds to the appropriate section in our Technical Paper to refer to for full details. BidiPass is an identity authentication protocol designed to strengthen today’s KYC model through a user-friendly and secure platform. This platform is made up of the components listed below that enable seamless connection and reliable authentication between the users and service providers. The BidiPass blockchain is used to issue, confirm and keep track of authorization requests from the service provider and users. BidiPass uses a hybrid blockchain approach to ensure a decentralized yet scalable network that is powered by Ethereum. The SDK (Software Developers Kit) will include a library written in several programming languages, making it easy for any service provider to integrate BidiPass into their existing software. The mobile application will be distributed through the official Android and IOS marketplaces. Users will be able to directly interact with BidiPass and the service provider through a simple and user-friendly UI. The BidiPass blockchain solution will be a hybrid of 2 different blockchains based on Ethereum: a private Ethereum setup (using PoW) and the Ethereum mainnet. The purpose of using a hybrid approach is to establish a sustainable and practical solution to managing authorization requests (AR) that can maintain a high level of security while keeping costs low and the platform scalable. User/Identity (2.2): a user who is using the BidiPass mobile application to verify their identity on one or more service providers’ platform. When the user first opens the application, a BidiPass blockchain account is automatically created to include an Ethereum keystore file and password associated to decrypt it. This data is stored privately and exclusively on the BidiPass application. Service Provider/Platform (2.3): This is the service provider hoping to validate user identities by connecting to the BidiPass network through the BidiPass SDK. Miner (2.7): BidiPass miners are rewarded with BDPp Coin for validating transactions and adding new blocks to the blockchain. BidiPass mining principles are inherited from Ethereum’s mining protocol. Decentralized Validator (2.8): Users on the Ethereum mainnet that stake BDP tokens in order to validate actions triggered by the service provider and miners on both blockchains. They are rewarded with BDP tokens. The BidiPass network will depend on both the BDP ERC20 Token and the BDPp Coin holding value. While the token economy will be built around the BDP Token on the Ethereum mainnet, BDPp Coins (on the private blockchain) will be an intermediate value holder used for rewarding BidiPass miners and to keep the ecosystem running. Rewarding Formulae (2.9): Miners and decentralized validators will receive different rewards based on the value of each block added to the blockchain. The service provider/platform will be able to connect to the BidiPass blockchain through the BidiPass SDK. The SDK will be available in several programming languages and will offer an easy-to-use API. Connect to a platform (4.1): Once the user is in the BidiPass application, they will be able to select the platform they would like to connect to. After authorizing him/herself as the owner of the device, they will be asked to scan a QR code to complete connection to the service provider platform. Transact Authorization Requests (4.2): After successful connection to a provider platform, the user will be able to select an action on the platform, then choose to “approve” or “reject” them. At this point, the application will proceed with an authorization request through biometric confirmation. Ensure a high level of security (4.3): Security is of utmost importance to BidiPass, and the BidiPass application is developed using the officially supported languages and SDKs from Apple and Google. To read about all local application security layers included, please refer to page 23 of the BidiPass Technical Paper. BidiPass is deeply aligned with the ethos of decentralization, using a hybrid blockchain approach to create a powerful and fair solution to existing cybersecurity problems. Our incentivization mechanism is designed to keep all players involved in the network, which will also keep the BidiPass network transparent and reliable. With a fully decentralized ecosystem built on the Ethereum blockchain, we are confident in BidiPass’s ability to scale effectively without compromising on compatibility and usability. Follow us on Twitter, Telegram, LinkedIn, or Facebook for the latest updates.